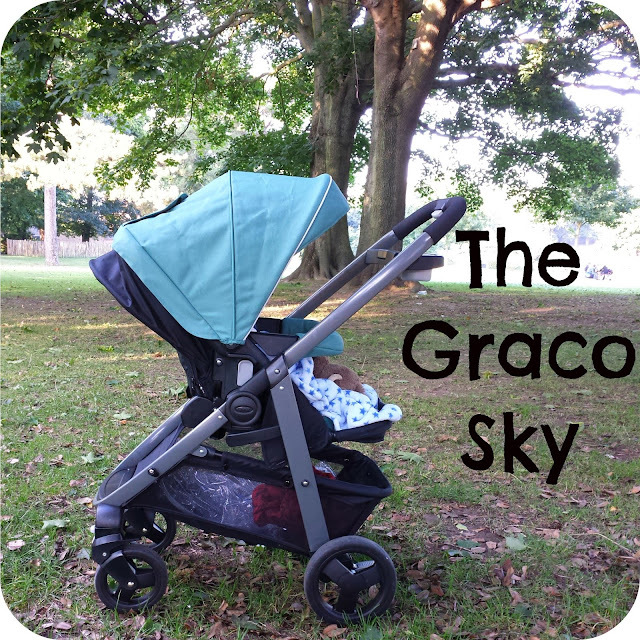 As part of Graco's Ambassador cometition we have been sent a Graco Sky travel system to review and I have been busy testing it with both the boys over the last few weeks. 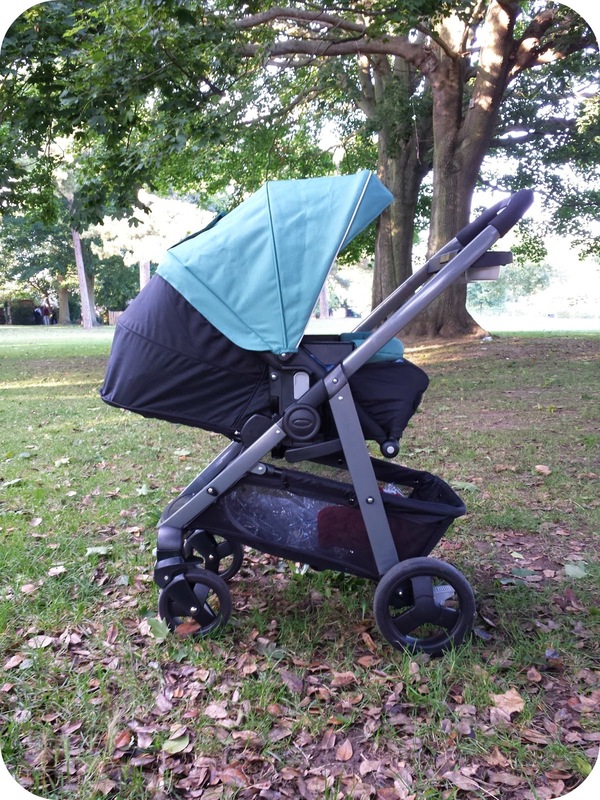 The pushchair comes in a choice of three colours, black night, sea pine green and purple shadow and all three are unisex enough for both boys and girls. I went for the green as it was a lovely and unique shade and I haven't come across a pushchair quite like it. The pushchair comes as a chassis, seat unit, footmuff, raincover and car seat and the seat can be either world or parent facing. This is a huge priority for me as even at 2 my toddler prefers to be facing me as we walk so that we can have a chat as we go. His new favourite pastime is singing me nursery rhymes and it works a lot better when I can hear what he is singing! The seat unit is plenty big enough to accommodate him (and he is a very large toddler - 99.6th centile for weight and height at 25 months), yet it still looks comfortable and secure with my seven month old in the seat. The seat is lovely and padded so perfect for smaller babies. This model doesn't come with a carrycot and instead has a newborn 'nest'. As the seat reclines, it creates a cocoon around the baby and the footrest comes up, revealing some material that attaches round with velcro making the nest secure, cosy and perfectly sheltered. 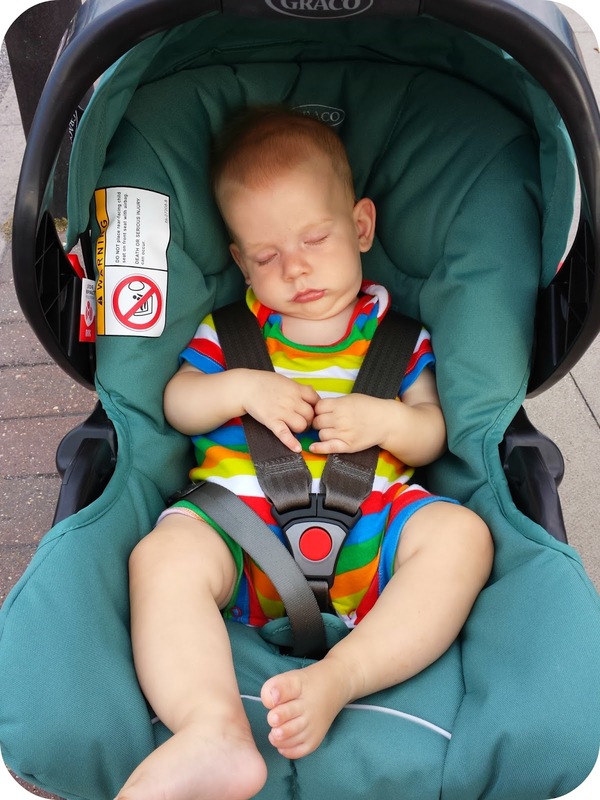 It has the benefits of a carrycot without the added piece to store although as Archie is a tummy sleeper, I would still have preferred a mattress for him as this will have the straps still. If I was using this for a newborn, I would pad the bottom out with blankets to create more of a bed. There is a handily placed parent unit by the handlebars with two drink holders and a seal-able middle tub which is perfect for munching on the go. The basket is quite frankly the best pushchair basket I have ever seen and I have been tempted to try and climb in myself to really test it. It has no problem holding my nappy bag, jackets for me and the boys, a small lunch box and my handbag and this is certainly my buggy of choice for shopping! 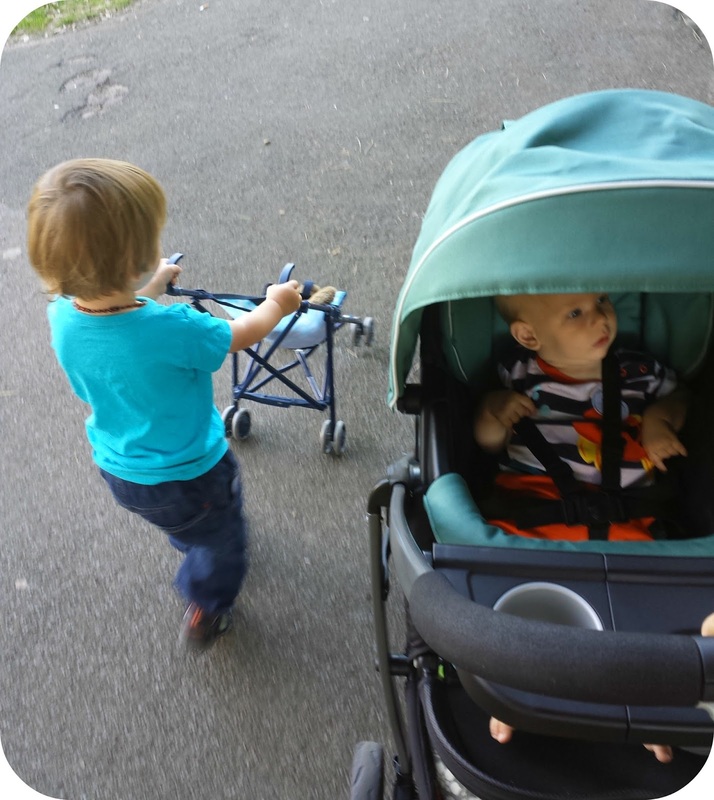 The carseat is easy to use and comes with a removable frame that helps it attach to the chassis. 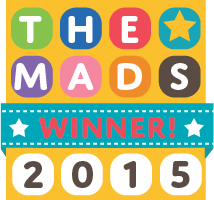 It seems secure, comfortable and safe and has a removable headrest for new babies. It has a 3 point harness which I find easier for using with a sleeping baby and still feels as safe as a 5 point parness. I would prefer it if the seat panel came off as it isn't fixed all the way round and it would be great if you could take it off to wash it. The seat unit is fully recline-able though and can be done so with one hand. I do find the material is quie hard wearing and I think it would be easy to clean with a sponge but being a paler shade and knowing what newborns are like with their nappies, I do prefer something I can pop in the washing machine. The fold is incredibly simple and can be done one handed too which is great for using it on public transport. It is surprisingly compact as well and can be folded with the seat still on when forward facing. When folded it is free standing though which is perfect for storing when there is not much space. 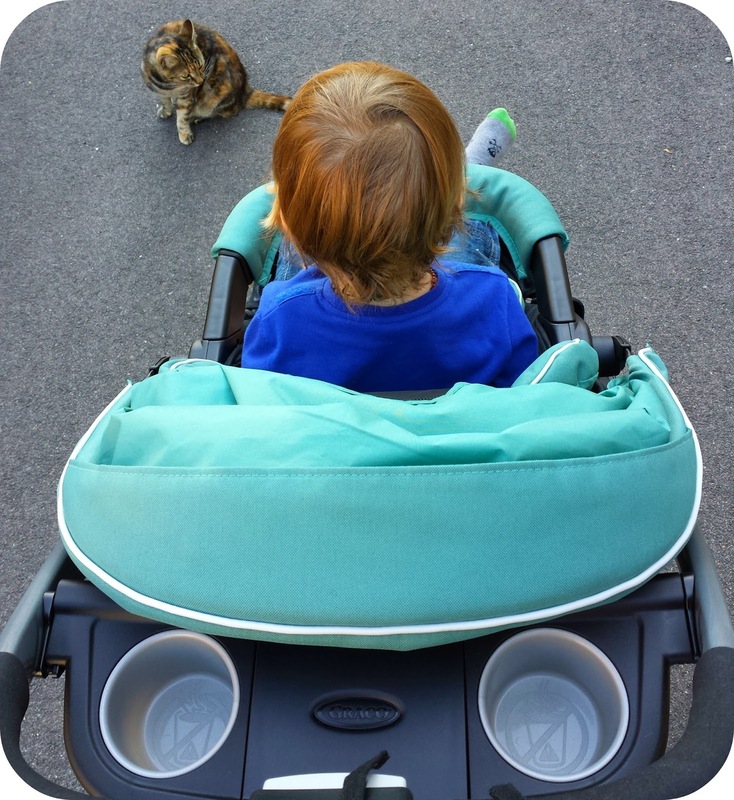 This pushchair is much more traditional looking than many of its competitors, but it still has all the features you would want from a travel system. It is sturdy, well built, comfortable and easy to push with such a great basket. I would recommend it as a great value travel system, as it comes with everything you need to get going. 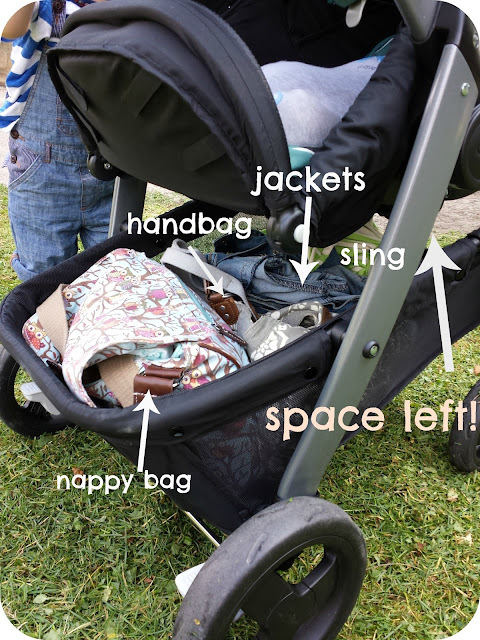 Although I do prefer a traditional carrycot, this would be great for those with little space to store bulky parts or for those on a budget as the newborn can comfortably use the seat unit as a nest or go in the car seat on the chassis for short periods. Love the colour! Can't believe how much stuff you got in the basket! What a fabulous colour. It looks a solid tough pram. We had one or two that just collapsed on us! 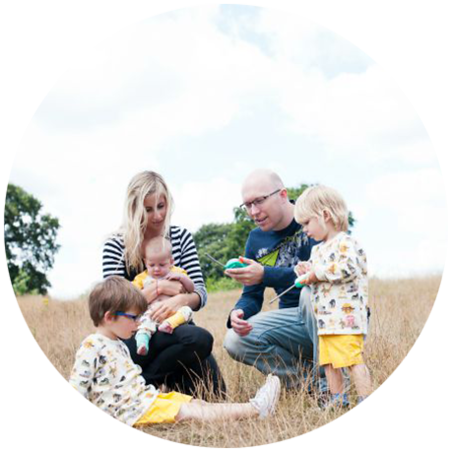 I love the colour and it coordinates with your blog too! Love the colour of this, can't believe how much storage space there is! 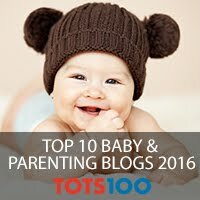 love the fact it can be parent facing for a toddler, I miss our chats when he's in a forward facing stroller! Awesome that you got sent one for review! There's lots of storage space to carry all sorts of thing. Colour is great too :)! Love the colour, we had a Graco it was a tank though. Glad its been updated it looks rather sleek!